“Venezuela doesn’t stand a chance anymore,” said Johnny Vargas, a frustrated restaurant worker who wishes he could leave the country. 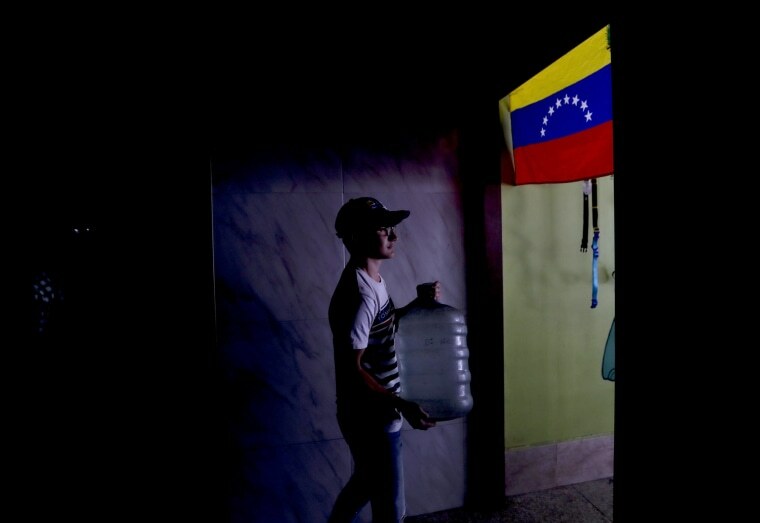 CARACAS, Venezuela — Much of Venezuela remained without electricity Tuesday as a new power outage spread across the country in what many feared will be a repeat of the chaos during the nation’s largest-ever blackout earlier this month. The outage began around midday Monday and appeared to have affected the majority of Venezuela’s 23 states. While the lights flickered back on in many parts after officials declared service would be restored within hours, the grid collapsed again in the late evening, knocking out communications and leaving much of the South American country bracing for the worst. As with the previous outage, President Nicolás Maduro’s government blamed U.S.-backed opponents, accusing them of sabotaging the Guri dam, which supplies the bulk of Venezuela’s electricity. Officials said the “attack” had been controlled, but their assurances, similar to ones the last time around, did little to calm the anger of residents in Caracas who filled traffic-clogged streets as they walked home after subway service in the capital was suspended on Monday. Their patience grew increasingly thin when a second outage struck late into the night, with residents in some neighborhoods banging on pots and pans in pitch black to express their growing frustration. On Tuesday morning, banks, shops and other businesses in Caracas were closed. Sitting on a bench in a plaza, 72-year-old Armando Taioli said he believed the nationwide blackout was the result of years of neglect of the power grid, compounded by pressures on the system from an expanding population. He gestured at people walking in the streets or traveling in buses and said they were adapting as best they could, but that he fears social unrest if the situation deteriorates. Netblocks, a non-government group based in Europe that monitors internet censorship, said the late evening outage had knocked offline nearly 90 percent of Venezuela’s telecommunications infrastructure. Even the powerful state TV apparatus was down. The outages come as Maduro is fighting to keep power amid a revived opposition movement and punishing economic sanctions from the U.S. The Trump administration, which is campaigning to remove Maduro, has denied any role in the outages. Meanwhile, electricity experts and opposition leader Juan Guaidó fault years of state graft and incompetence. Maduro’s government says it is following socialist principles championed by leader Hugo Chavez, who died in 2013. “This outage is evidence that the dictator is incapable of resolving the crisis,” opposition leader Juan Guaidó wrote on Twitter. The government seeks to discredit Guaidó, presenting what it claims to be evidence purporting to show opposition plans to hire mercenaries from Central America to carry out targeted killings and acts of sabotage. During a news conference in the middle of the blackout Monday, Communications Minister Jorge Rodriguez showed screenshots of what are purportedly private text messages between Guaidó, his mentor Leopoldo López and other opposition insiders discussing payment details to the hired guns through banks in Europe and Panama. The opposition has yet to comment but normally shrugs off such charges as attempts by the government to shift blame for its own ineptitude. Late Monday, Lilian Tintori, the wife of López, said a group of government loyalists on motorcycles besieged her home in eastern Caracas, shouting epithets against her husband and warning he would soon be thrown back in jail. López has been under house arrest following his conviction for stirring anti-government unrest in 2014 in a case marred by irregularities.